It's time to start panicking about CNY dinners! Most restaurants are filling up fast, with some already fully reserved for Chinese New Year’s Eve. So it's gonna be a furious week of CNY posts on the blog. Here's one for you at Peach Blossoms at Marina Mandarin! Chinese New Year is not complete without the ubiquitous Yu Sheng. Health conscious foodies have turned their backs on the traditional Yu Sheng that often gets additional sweetness from candied goodies like ginger and winter melon. 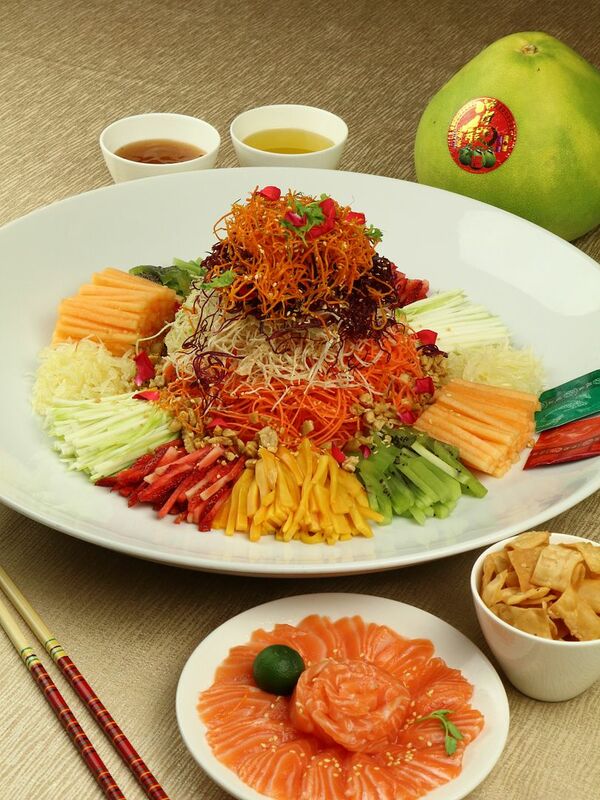 Peach Blossoms' Marina Mandarin Salmon Yu Sheng with mixed fruits uses an array of colorful fruits that naturally sweetens the dish with the mix of shredded strawberry, jackfruit, kiwi and rock melon. We definitely approve the concept of eating by colors! Guaranteed to elicit oohs-and-ahhs is the Barbecued Whole Suckling Pig. Golden brown, yet thin and crispy, the suckling pig skin goes exceptionally well with the steamed buns and sweet sauce that are served alongside. Other highlights from the Chinese New Year festive set menus include the Double-boiled Kampung Chicken Soup with Premium Matsutake Mushroom. Affectionately also known as Japanese Truffle, the Matsutake mushrooms imparts a heady aroma and earthy flavour to the nourishing double boiled chicken soup, providing much comfort and satisfaction. Peach Blossoms elevates the now commonplace salted egg prawns to a luxurious level with their Baked Boston Lobster with Creamy Salted Egg Yolk and Cheese. Rich but not overly unctuous, this dish is sure to win over even your fussy grandmother! For something a little less decadent but no less satisfying, there is the Steamed Silver Cod with Black Garlic and Grains. Black garlic is the darling of health food, and is touted to be rich in antioxidants and even promotes longevity. Besides dining-in, patrons can also consider taking away items from the special festive menu. The Blossoms Abalone Treasures Pot, consisting whole abalone, fish maw, sea cucumber, prawns, dried scallops and oysters and an assortment of roast meats, is your golden ticket to your future in-law’s heart. Other highlights from the menu include Peach Blossoms Buddha Jumps Over the Wall, a variety of Yu Sheng, Nian Gao, various CNY cookies as well as Bak Kwa.